When it comes to plastic waste, fruit and vegetable packaging is one of the biggest challenges food retailers face. 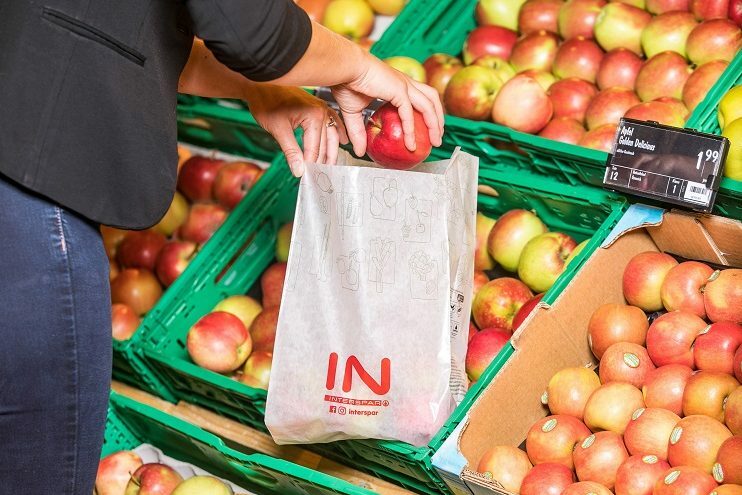 In an attempt to address this problem, SPAR Austria has introduced free paper bags for fruit and vegetables, on a trial basis, in 11 INTERSPAR Hypermarkets in Salzburg and Styria. This isn’t the first step the SPAR Partner has taken to reduce plastic waste. In April, it introduced a drawstring polyester net for loose fruit in all INTERSPAR Hypermarkets. The reusable bag is washable and environmentally friendly, and is available as a four-pack for €1,49. Up to eight pieces of fruit or vegetables can be transported per bag. “Ideally, our customers carry a reusable net with them for their fruit and vegetables, but we also need to offer another solution. For this reason, we are testing the use of free paper bags,” said Managing Director of INTERSPAR Austria, Markus Kaser. In 2016, SPAR Austria experimented with the use of brown paper bags in a limited number of stores in Vienna. Unfortunately, the bags proved impractical as cashiers couldn’t easily see the contents. Based on that learning, the new trial is being conducted with transparent parchment paper bags which are also a more optimal size. The paper bags are made of Forest Stewardship Council (FSC) certified paper and can be disposed of organically. SPAR Austria is contributing to the reduction of plastic through a variety of measures and as part of the sustainability agenda from the Ministry of Sustainability and Tourism, SPAR Supermarkets and INTERSPAR Hypermarkets managed to save more than 20% of fruit & veg plastic bag waste last year. However, it’s not just fruit and vegetable packaging that the company is concerned with. Across all product ranges, attention is being given to using environmentally-friendly packaging. For example, the packaging of SPAR enjoy sandwiches has changed from plastic to cardboard, helping to save 22 tons of plastic per year.